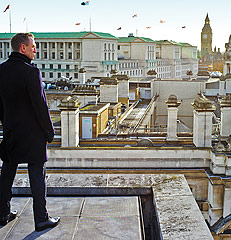 Skyfall, courtesy MGM and Columbia Pictures. The latest James Bond movie, Skyfall, may not be Bond’s sexiest, over-the-top adventure yet, but it might be his most vital: The theme of the movie is relevance… old vs new… and Bond’s place in the post-Cold-War era. M and MI6 are similarly attacked—literally and, apparently, easily—as the villain applies the latest computer tools to the old-school organization, and brings into question whether or not this stodgy organization, and its spies, can keep up with the modern era. My spoiler-free review, for what it’s worth: Skyfall does an excellent job of answering the question, showing us a Bond that’s had hard knocks (what else is new? ), but manages to keep coming back. We still have great Bond stunts, fights and chase scenes. The villain is done over-the-top-style, but fits well into the story’s theme. And we get a rare glimpse into Bond’s past—his own past, not just the appearance of the Astin Martin DB5 (which actually has only a minor role in the film). In fact, the post-Cold-War issue has always been a part of the Bond movies, but never directly addressed as clearly and succinctly as it was here. I highly recommend the movie, especially to those who wonder about the future of the franchise. James Bond isn’t the only one concerned about relevance in a world that seems to be developing beyond his original purview. Science Fiction is having similar issues. As the world grows up, as science develops, people are coming to realize that the likelihood of meeting aliens like us (or, for that matter, any aliens at all) is increasingly remote; that we won’t be sailing from star system to star system as easily as boarding a luxury liner; that exotic transporters, energy weapons, Earth-like planets and exciting star wars aren’t likely to be in anyone’s future. The cool stuff that SF has shown us over the years is now considered silly and old-hat. As well, we’re coming to grips with technology that seems to be outrunning us today: Computers have shrunken to palm-sized, and have begun to fool some people into thinking they are sentient; our cars can track traffic patterns that affect our route, and soon may be doing the driving for us; increased communications with our friends and relatives give rise to concerns about complete strangers tracking us and threatening our privacy. The worlds of SF seem to be upon us today. So what do we need SF for? The Bond franchise has always been known for its trappings (which featured many of the same trappings as SF); and at times, it seemed the trappings were all that was really there. But there has always been a deeper level to Bond films. Bond was never about just the gadgets; at heart, James Bond is about applying a combination of the latest tools with Bond’s extraordinary skills at endurance, combat, psychology and intelligence to troubleshooting and foiling threats to the common good, whether they were political, financial or scientific. Psychology and intelligence were always common to Bond: His ability to read and outguess his opponents, to divine their plans and work out counter-plans on the fly, were as important as his toys and his ability to outrun an explosion. This is what continues to make Bond relevant: Not just his physical capabilities, but his unique knowledge of human behavior and capabilities, and his finely-honed intelligence and strategic skills. Science Fiction is likewise commonly known by its trappings: The utopias and dystopias; the spaceships and rayguns; the green-skinned Orion women and the acid-blooded aliens; the androids and sentient computers. But SF has always been much more than that. SF is at its best when it uses those trappings as ways to explore human reactions to them, to see how they impact individuals and groups… what they mean to personal and communal development. Stanislaw Lem’s Solaris, for one example, could have simply presented us with a planet that created copies of people out of the scientists’ pasts, and that would have been it; instead, the people created by the planet were directly related to traumatic moments in the scientists’ lives, forcing them to revisit painful memories and reconsider their deepest beliefs about life, love, responsibility and compassion. The rebooted Battlestar Galactica is another good example of the heart of SF: It outright abandoned most of the physical detritus of SF, keeping only the spaceships and the concept of sentient robots; and in so doing, presented viewers with a much clearer view of an old morality tale, involving race, prejudice and paranoia, psychology and relationships. Galactica has become one of the most celebrated SF television shows, primarily by removing the set dressing and putting a tight focus on human relevance. That is Science Fiction at its best: Seeing past the trappings, and exploring what they mean to the people; examining the impact on society and on individuals; considering the future of our development, and whether that future will be better or worse for us. Science Fiction is never about the gadgets—it’s about the people who use them and are impacted by them. The future of SF will be its ability to find the human relevance of science and future trends, and to present that to its audience. And as long as it can continue to do that, it will remain a part of our culture. Next Next post: Cloud Atlas: Doomed to fail in the U.S.?